Cinco de Mayo or May 5th is a Mexican day of celebration, very popular in the USA, which commemorates the victory of the Mexican army over French forces at the Battle of Puebla– not Mexico’s Independence Day, folks! The celebration includes music, dance, great food, and of course, drinks. You may be asking yourself what this has to do with Brazil and this blog, right? Well, besides the fact I live in the United States where the celebration is popular, nothing at all. I don’t usually celebrate the date… until this year, when my fellow blogger, Kate from Hola Jalapeno, invited me and a bunch of other Latin and American bloggers to celebrate this fiesta with Margaritas. So yes, babe, it is #margaritaweek… and there is a flavor for everyone. 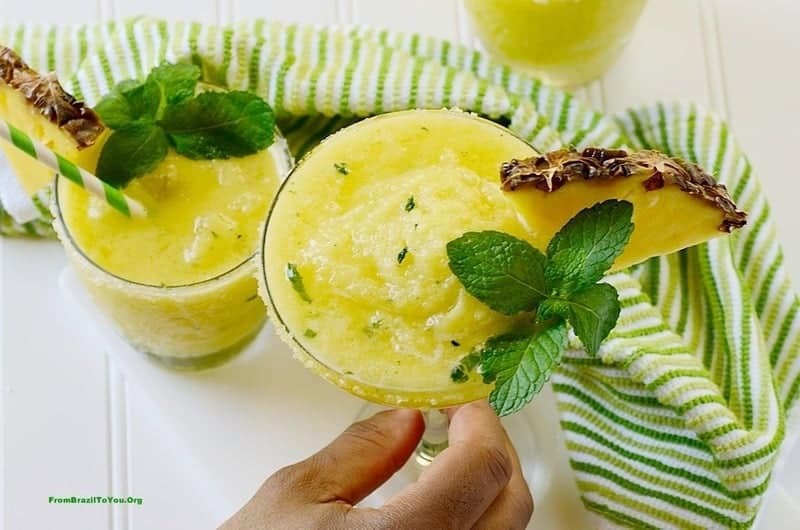 Because this Brazilian has joined the fiesta, I had to put something of Brazil in it: namely, the combination of flavors of pineapple and mint, which is very popular in Brazilian drinks, and of course, the green and yellow of the Brazilian flag. … and this celebration is the perfect excuse to lift a glass full of goodness. Make it, take a sip, and experience a fiesta in your mouth. 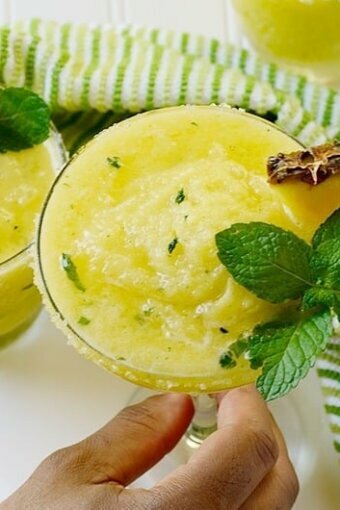 A super refreshing and delicious slushy Frozen Pineapple Mint Margarita to celebrate 5 de Mayo in style. Cheers! In a blender, blend all ingredients together (except the ice) until obtaining a homogeneous mixture. Add the crushed ice and blend the mixture until it forms a slush. Set aside. Pour into a glass with coarse salt around the outside rim (optional) and enjoy! 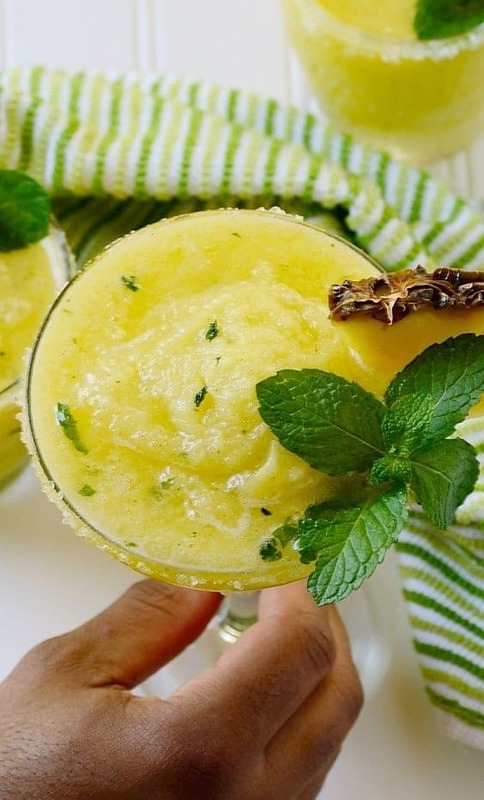 It can be garnished with a quarter slice of pineapple on the rim of the glass and mint leaves. SERVES: 1-2 people depending on the size of the glass. NOTE: To put coarse salt around the rim of the glass, pass a cut slice of lime around the rim, and then invert glass to dip and coat the moistened rim in a bowl of coarse salt. Make sure salt coats the rim well. For a virgin version, use (flavored) sparkling water instead of tequila. Oh my gosh, I love this so much!! I love how you incorporated some Brazilian flare into this drink. Thanks so much for sharing this amazing recipe!! Thank you, Chris! It would go great with tacos, don’t you think? Amazing color and fabulous flavor too! This is a wonderful celebration drink! Wishing you a very Happy Cinco de Mayo, Deb! Cheers to you! What a festive margarita! Looks so pretty! Thanks a lot, Hadia! Happy Cinco de Mayo and also Mother’s Day to you! Happy Cinco de Mayo! Not at all a big deal in Mexico, I know, but I like it. Particularly since it gives me a chance to drink a margarita! 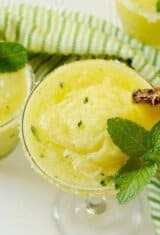 Never had a pineapple-mint one, but love the idea. This looks terrific — thanks. Hey… any day is good to celebrate life. ? Wow! 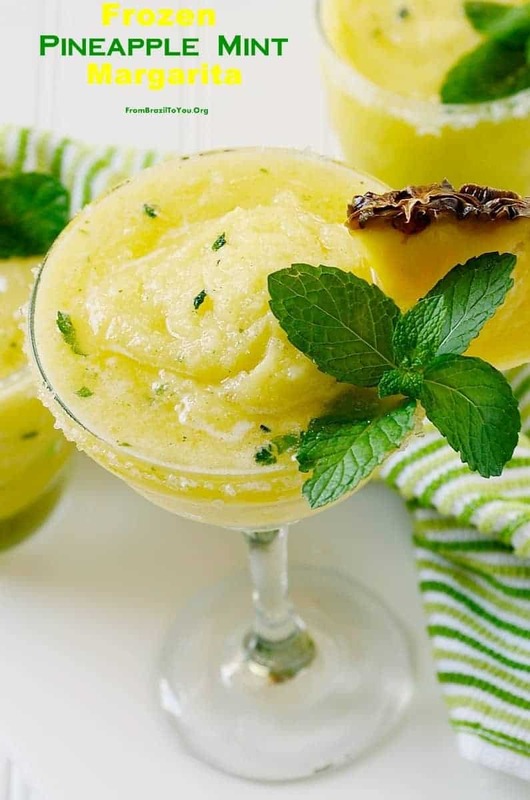 This margarita looks so beautiful and refreshing! Thank you, Anu! Welcome to FBTY. Wishing you a very happy day, celebrating or not El Cinco de Mayo.